To keep the tomatoes producing after the weather changes and the summer sun goes away, I thought about bringing them indoors and using the spare fixtures that have been sitting stored. The fluorescent is an LOA for T8s and has 5000K lamps. The ITT yard light has its mercury ballast removed and since it’s plastic, it barely weighs a thing. I can connect it to a remote ballast; right now it’s 100w HPS. Not sure how well this setup will work but the main point of it was making it lightweight, cheap and easy to disassemble for storage. 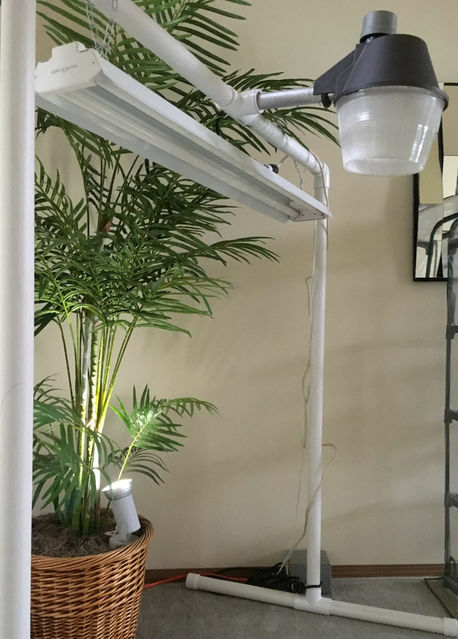 The lights you have should work fine for what you have and the plants you are lighting. Be very cautious about bringing *any* plant inside - last thing you want to do is end up infesting your other plants with the bugs that they will bring in. (if you do decide to bring them in, spray them (and the dirt) with vegetable/fruit safe insecticide first, then keep them in a room separate from all other plants for atleast a month..keeping close eye out for any signs of bugs). You'd probably be better off starting new seeds. Sorry to say, but that shoplight - even a few of them (and even if you've wired it for overdrive) simply will never do...tomatoes need allot of light. - think more along the line of a whole bank of fluorescents - like more than 6 T5 or T8 HO lamps ... more like something you'd see for a certain other non-vegetable, but for some reason very popular plant. What if you used both mercury Vapor and HPS? And ditched the fluorescent? You'd basically get both sides of the spectrum blue and red... You could also use metal halide instead of mercury Vapor but I think mercury Vapor probably has alot more blue content.. I've heard that MV is useless for plants. Maybe that's just the clear lamps though? Possibly a phosphor-coated MV would do some good?? MH on the other hand certainly could be used, even just by itself. When I got my first mercury fixtures (2 175w yardblasters) I tried growing catnip under clear and coated lamps. The clear lamp didn't really work, but the coated one had really good results. I think clear MV is .might. be the wrong part of the blue spectrum...and more importantly it lacks the red which plants need. So makes sense that a coated lamp would give better results. HPS seems to match that the best. The reds where the HPS would come in. That was what I was originally saying.